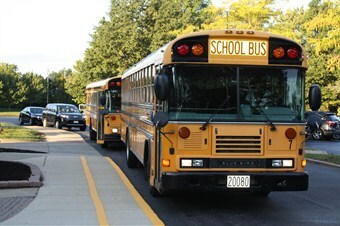 Click here to download the Beachwood Schools Bus Safety Brochure. If your child needs a pick-up or drop-off due to an emergency, please call our office and we will be happy to accommodate you. If your circumstances change during the course of the school year, you may call our office to adjust your transportation needs. To request that your child(ren) be transported to or from locations other than school and your residence, please click here to fill out the alternate pick-up and drop-off form. Alternate locations(s) will be the permanent address for drop-off and pick-up (and that it may not be changed from week to week) and be located on a regularly established bus route at the time of day that is available on that route. The actual stop location assigned will be an already established school bus stop. Parents of students attending Beachwood Middle School or Beachwood High School, please be aware that students missing their bus at the school of attendance may NOT board their bus at the other location. This policy is for the safety of all student and will be strictly enforced. If your child wishes to ride home with a friend, please call our office the day of the request to get approval. Notes will NOT be accepted at the Middle or High Schools. Thank you for allowing us to transport your children and please remind them that the rules are enforced in order to ensure their safety each and every time they ride our school buses. Contact our office with questions regarding your child’s transportation.